Amazon has unveiled a set of five new devices to add to its Kindle Fire HD tablet lineup, starting from as little as $100 and covering three different screen sizes. The new range of devices will appeal to both power users and those who are looking for a bargain, and the online retail giant has even introduced a tablet specifically aimed at kids. At the top end we have the Fire HDX 8.9, a tablet that is said to be designed to directly compete with the iPad Air, says The Guardian. It is the first Android tablet to boast Qualcomm's new 2.5GHz Snapdragon 805 processor, which provides with a significant step up in graphics power - with a 70 per cent faster graphics engine. The HDX houses a 2560x1600p screen, a sharper display than the Apple iPad Air. Amazon's Dynamic Light Control function is integrated into the HDX, which will automatically adjust the hue of the display depending of the surrounding lights. Aiming to follow Microsoft's Surface tablets and other convertibles, Amazon will provide an optional Bluetooth keyboard and Origami case to turn the tablet into a 'mini PC'. The Amazon Fire HDX 8.9 is priced from $379 (4G versions is $479). We then have a new 6-inch Amazon Kindle HD tablet priced at an affordable $100, with hopes to attract a much broader audience. "If you get down to those low price points, you start to trade stuff off," Amazon VP Peter Larsen said, when speaking about the poor-quality low priced tablets from other companies which sell on Amazon and are frequently returned, reports WSJ. "We hear about it from customers all the time." The $100 Fire HD 6 is accompanied by a redesigned 7-inch Fire HD 7 tablet priced at $140. Both of these new Fire HD devices come with a 1280x800p display and quad-core MediaTek processors, and are available in five colour variants. The affordability of these tablets may pose a big threat to companies such as Samsung, especially with the rugged elements to their build. We are told they can survive a drop from one meter and from being generally tossed around. Lastly, we have the Kindle Fire HD Kids Editions in 6 and 7-inches. These offer the same core specs as the Fire HD 6 and 7. The Kids Edition however, runs a simplified mobile OS that is icon-based for kids to take advantage of apps and media content. They come with an ultra-durable case. 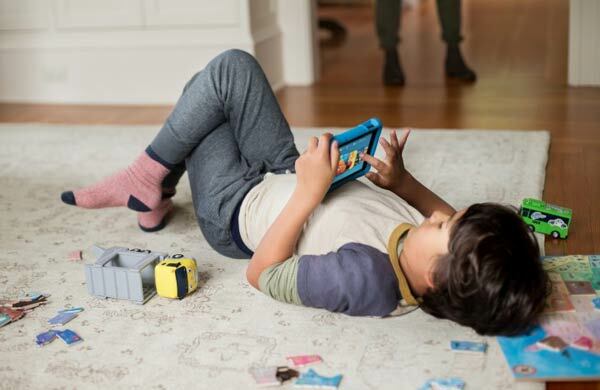 Amazon is offering to replace the tablets no matter what the kids do to them as part of their 'Worry-Free Guarantee', which covers any damage for two years. Another feature parents may appreciate is the pre-installed Free Time software, which will allow time limits to be set on what apps can be used on the device, along with setting goals and rewards for collecting reading and educational app times. The Kids Editions will be offered at $150 for the 6-inch and $190 for the 7-inch version. Alongside the tablets, Amazon also made an announcement regarding an update to its operating system, Fire OS 4.0 'Sangria'. Additional features include family sharing of content across Amazon accounts, including Instant Video, and a new profiles feature designed to let users sign straight into their apps and TV shows. A pair of new Amazon Kindle e-readers were also unveiled today. 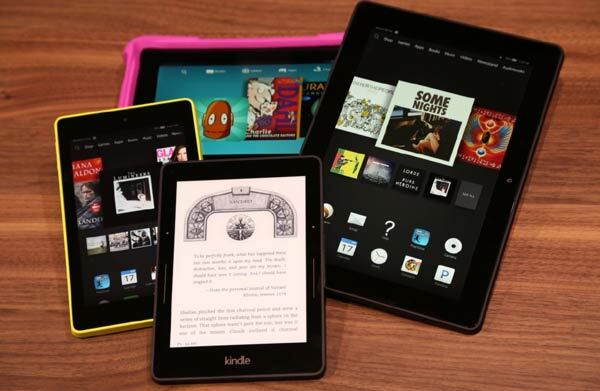 This lineup includes the Voyage, weighing in at only 180g, touted as the thinnest ever Kindle reader at 7.8mm thick. The 6-inch, Kindle Voyage is priced at $199 and was shown off next to a new version of the company's original Kindle, featuring a touch display.